No church is mentioned in Crich at Domesday (1086). The nave and north aisle of the present church were built between 1135 and 1189. 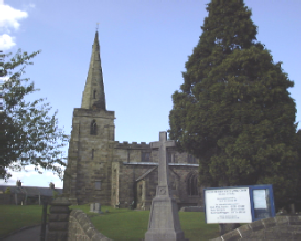 The church was enlarged in the fourteenth century. In 1356 Sir William de Wakebridge endowed a chantry chapel in the north aisle and in 1368 he founded the chantry in the south aisle. The Galilee Tomb in the north aisle is generally believed to be his effigy. Sir William sat in Parliament at the time of Edward III. After he lost his wife, hie father, three brothers and two sisters in the Black Death, he gave himself to religion. Crich is set high on the hills to the east of the River Derwent, roughly five milss south-east of Matlock and four miles west of Alfreton. Tne village is aptly named as Crich comes from the old Celtic name for a hill. A short way from the churoh is Crich Stand. This memorial was dedicated in 1923 to the 11,409 men of the Sherwood Foresters (Nottinghamshire and Derbyshire Regiment) who died in The First World War. Later a plaque was added for those who lost their llves in the Second. The Memorial stands 950 feet above sea level. (See this page).